Mon., July 10, 2017, 4:22 p.m.
A meeting between Donald Trump Jr. and a Russian lawyer was set up at the request of Emin Agalarov, a Russian pop star whose Kremlin-connected family has done business with President Donald Trump in the past, according to the person who arranged the meeting. Rob Goldstone, a music publicist who represents Agalarov, confirmed on Monday that he requested the Trump Tower meeting at Agalarov’s request. Emin Agalarov and his father, Aras Agalarov, a wealthy Moscow real estate developer, helped sponsor the Trump-owned Miss Universe pageant in Russia in 2013. Goldstone had previously told The Washington Post that he set up and attended the meeting for the lawyer, Natalia Veselnitskaya, so that she could discuss the adoption of Russian children by Americans. The revelations about the meeting come as federal prosecutors and congressional investigators explore whether the Trump campaign coordinated and encouraged Russian efforts to intervene in the election to hurt Clinton and elect Donald Trump. In a new statement, Goldstone confirmed what Trump Jr. himself revealed Sunday: That he enticed the then-Republican candidate’s son by indicating that Veselnitskaya could provide damaging information about Democrats. The involvement of the Agalarovs brings the meeting closer to both Trump’s past business interests and to the Kremlin. Trump has spent time with both Emin Agalarov and his father, Aras – appearing in a music video for the Russian musician, which was filmed at the Moscow Ritz-Carlton Hotel in 2013. Meanwhile, the Agalarovs are also close to Russian President Vladimir Putin. Aras Agalarov’s company has been awarded several large state building contracts, and shortly after the pageant, Putin awarded the elder Agalarov the “Order of Honor of the Russian Federation,” a prestigious designation. Emin Agalarov told The Post last year that he had spoken with Trump numerous times about the need to build stronger ties between Russia and the United States. “He kept saying, ‘Every time there is friction between United States and Russia, it’s bad for both countries. For the people to benefit, this should be fixed. We should be friends,’ ” Emin Agalarov told The Post last year about his conversations with Trump. A spokesman for the Agalarovs did not respond to request for comment, nor did a spokeswoman for Trump Jr.
On Monday, the Kremlin said it was unaware of the meeting between Trump Jr. and a Russian lawyer purported to have information that could potentially damage Hillary Clinton’s presidential campaign. Veselnitskaya has for the past several years been a leading advocate around the world to fight a policy imposed on Russia for human rights abuses, which have been vehemently opposed by Putin and other leading Russian officials. Putin personally assured Trump at the Group of 20 summit in Hamburg over the weekend that Russia had not meddled in the 2016 election. Putin’s comments, however, did little to change widespread views in the United States that Russia was behind the election meddling intended to help Trump. Hackers began leaking emails stolen from the Democratic Party in July 2016, and U.S. intelligence agencies have said the effort was orchestrated by Russia. 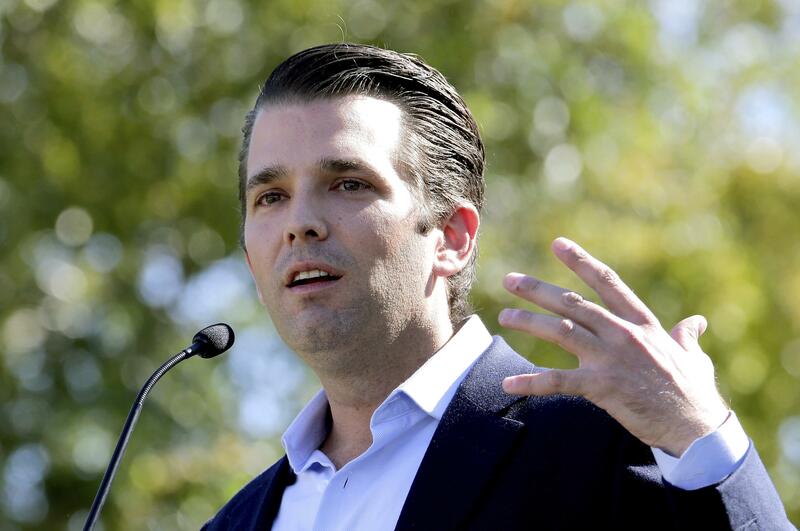 The president’s eldest son said in a statement Sunday said that he had agreed to the meeting at Trump Tower in New York because he was offered information that would be helpful to the campaign of his father, then the presumptive GOP presidential nominee. At the meeting, the Russian lawyer opened by claiming she knew about Russians funding the Democratic National Committee and Clinton, the statement said. Trump Jr. said that his father “knew nothing of the meeting or these events” and that the campaign had no further contact with the woman after the 20- to 30-minute session. The meeting suggests that some Trump aides were in the market to collect negative information that could be used against Clinton – at the same time that U.S. government officials have concluded Russians were collecting such data. Mark Corallo, a spokesman for Trump’s attorney, said the president was unaware of the meeting and did not attend it. Neither Manafort nor his spokesman responded to requests for comment. Attorneys for Kushner also did not respond to requests for comment Sunday. On Saturday, a Kushner attorney, Jamie Gorelick, said her client had previously revised required disclosure forms to note multiple meetings with foreign nationals, including the session in June with Veselnitskaya. “As Mr. Kushner has consistently stated, he is eager to cooperate and share what he knows,” Gorelick said. Veselnitskaya has not responded to requests for comment from The Post but told the Times in a statement that she had never acted on behalf of the Russian government and that the meeting included no discussion of the presidential campaign. She has for the past several years been a leading advocate around the world to fight the Magnitsky Act, sanctions intended to rebuke Russia for human rights abuses. Putin reacted angrily to the passage of the act, and has since denounced it repeatedly. The acts are named for Sergei Magnitsky, a Russian auditor who died under mysterious circumstances in a Moscow prison in 2009 after exposing a corruption scandal. The meeting occurred during a period of intense focus on the Magnitsky sanctions. Four days after the June 9 Trump Tower session, Veselnitskaya was in Washington attending a House Foreign Affairs Committee hearing about sanctions and other aspects of U.S.-Russia relations. That evening, a film critical of the Magnitsky sanctions – and the story behind them – showed at the Newseum. On June 15, Veselnitskaya was featured on the Sputnik News website criticizing the sanctions and its leading advocate, William Browder, a financier who left Russia a decade ago amid concerns about corruption, including what was exposed by Magnitsky, the auditor he had hired. Published: July 10, 2017, 4:22 p.m.